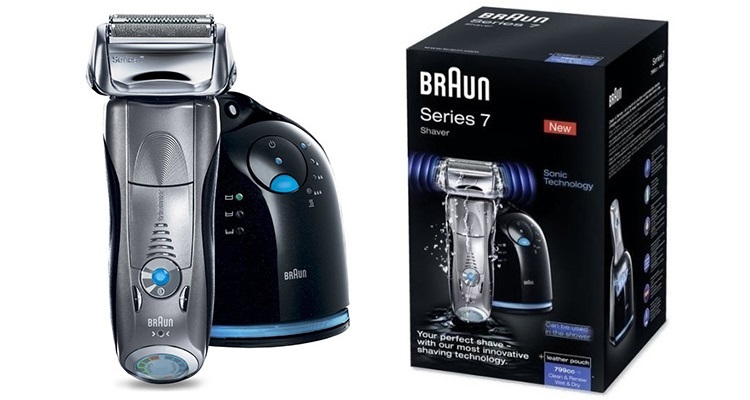 Braun Series 7 Review: Why Should You Purchase This Electric Shaver? 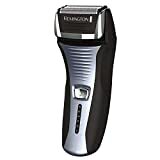 Electric shavers are a popular product line because they give a close shave in less time than traditional shaving methods and without shaving prep time. Technology continues to advance in this field providing more effective and versatile options. The Braun Series 7 models are leading the pack. Braun offers several unique features with this series, and we look at those features in this in-depth review. Braun has a long and excellent history of producing high-quality shaving products. The company was originally established in 1921 by Max Braun. For several decades it concentrated on producing innovative kitchen appliances. 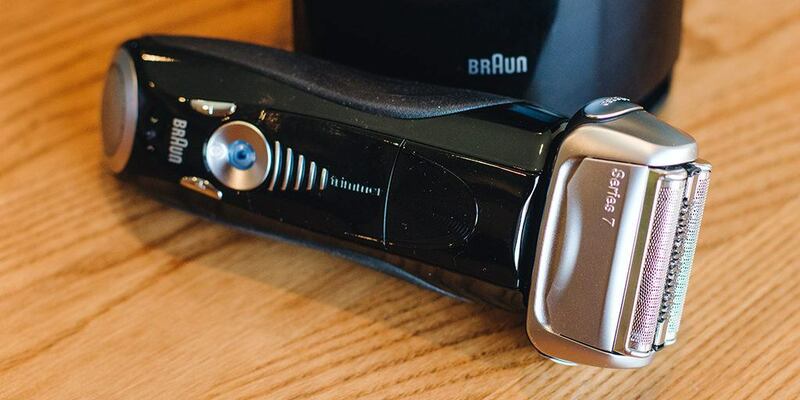 The first dry foil shaver was developed in 1950, and by 1988, Braun had manufactured 100-million shavers. Market dominance in this field has been maintained in the decades since then through a commitment to quality and excellence. The innovative design of the Braun Series 7 features OptiFoil™ combined with an ActiveLift trimmer which produces an enviably close shave with the first pass. Both features work together to properly lift and remove facial hair in the most comfortable way. It stands out among electric shavers because it is one of only a few that are submersible and can be used for dry or wet shaving. What Makes Braun Series 7 Unique? The wet or dry shaving option is something few other manufacturers have tried to attempt. Even among the others that have ventured forth, the Series 7 is unique because it is fully submersible up to a depth of 15 feet. Since water is not an issue, it can be used in the shower or tub if you prefer. While several other models can be rinsed with water, submerging one completely is not recommended and may make it unusable. In just one hour, the shaver reaches full charge capacity. If you forgot to put it back on the charger after your last use, a quick charge takes only five minutes and gives you enough power for a full shave. When fully charged, the battery will keep the shaver running for about 50 minutes of total shave time. One thing that has been bothersome in electric shavers before now is how hard they are to keep clean. Over time, hair debris collects in inaccessible areas and it loses efficiency, not to mention the shaver sometimes develops a bit of a smell. Braun has solved that problem with their Clean & Charge Station. While the unit is charging, it cleans and lubricates itself with just the touch of a button. The station is designed to hold an alcohol-based solution that is 10 times more hygienic than using just water alone to clean the unit. The shaver looks and feels like a new razor every time you use it after a cleaning. This is an especially popular feature in households where more than one person is using it. The shaving head of the Series 7 is free to move as needed. There is no problem getting the shaver to follow the contours of your face because it moves in eight directions. This flexibility allows the cutters to get within 0.05mm from your skin for the smoothest possible shave. Up to 40-degrees of pivot is possible with the head flexibility. Additionally, all cutting devices are on individual suspension anchors, so the razor can immediately adapt to even the slightest of contour changes. The head can be locked into any position by simply sliding a button if you prefer a static head angle for hard to reach areas. AutoSense Technology. The shaver adjusts to the thickness of your facial hair by monitoring how dense your beard is and adjusting motor speed accordingly. Extra power is provided to shave the areas where your hair is the thickest. Every shave is personalized to each area of your face. Intelligent Sonic Technology. 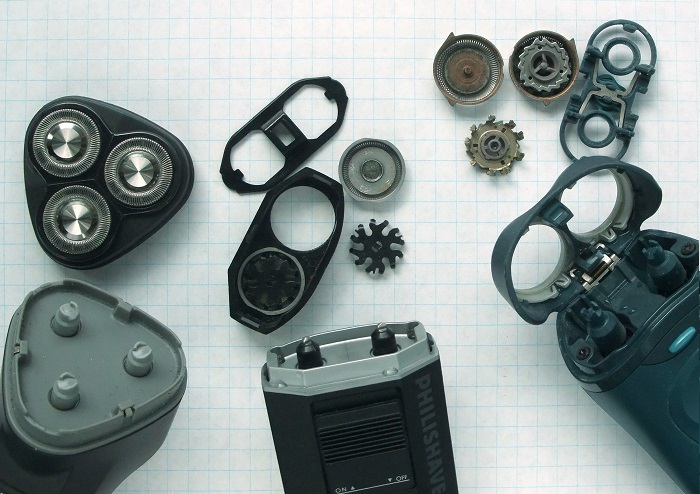 Every minute, 10,000 micro vibrations help to lift and trim extra hair with each pass of the cutters. In addition, 30,000 cross-cut actions per minute quickly remove any hair in the way. The sonic advantage is unique among its competitors. OptiFoil™. The holes in the trademarked foil are specially crafted to capture each and every hair in the path of the shaver. Incredibly thin, it allows the cutters to get as close as possible to your skin for the closest shave. The foil also protects the skin, so there is no irritation from the shaving process. Protective SkinGuard. The unique SkinGuard technology gently smooths the skin before the cutters pass over the area for a better shave experience. It also protects the skin from undue friction that might cause razor rash from other devices. ActiveLift Trimmer. There is no difficulty in removing hairs that are lying flat thanks to the exceptional ActiveLift Trimmer in the middle of the shave head. No matter what direction the shaver is moving, it lightly lifts each hair so that it can be removed by the cutters. Most, if not all, hair is removed with just one stroke. 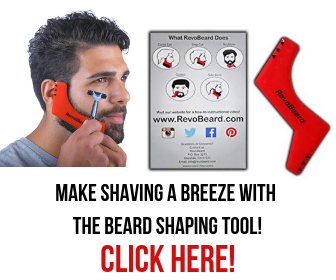 Quickly shape beards, sideburns and mustaches with the pop-up trimmer built into the handle. Simply slide the button up to access the trimmer. When no longer needed, it gently clicks back into place by pushing it down with your finger. At the bottom of the unit, an easily read display shows the battery level. The display shows three level steps when indicating power available. No power or performance is lost as the battery power decreases. Use the push-button to select one of five different sensitivity and turbo modes. The ease of switching modes is ideal for moving to skin areas with higher sensitivity. There are four models available in the Braun Series 7 family, and there is little difference other than product color between the various options. Online prices range from around $150 on the low end up to $285 on the high end. The shavers are available from many major retailers including Amazon, Target and Newegg. When this series was introduced, several models were available without the Clean & Charge Station. While most of those models are no longer available, some retailers might have stock on hand. If you find a lower price, be sure to verify that it includes this valuable feature. Reviews online for the Braun Series 7 line are consistently high. It is a top selling option on most retailer sites with thousands of ratings at the highest rank possible. Consistently, customers report how much they love their purchase. Most of them are very impressed at the close and comfortable shave it delivers. The few negatives we were able to find from reading reviews tended to revolve almost entirely around shipping issues. 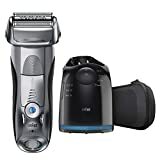 There were almost no negative reviews with issues related to the shaver itself. An interesting side point is that more than a few customers included in their review that they purchased a Series 7 as a gift for someone else. In all the reviews we read, the consumer then reported that the gift was very well received. Comparisons are sometimes tough to make when looking at the Braun Series 7. The reason why is that Braun features so many benefits that are just not available from other manufacturers. When there is such a difference, it almost becomes an apples and oranges scenario. Still, there are a few great brands that do go head to head with this product. Here are a few of the models we looked at. Phillips Norelco has excellent wet-dry shavers in the 9700 models. 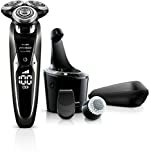 The shaver is available at a similar price point to the Series 7 and does well when stacked alongside it. The 9700 features a cleaning station and consistently high customer reviews, though the reviews did tend to be a little lower than Braun’s. The unique 3-head shaving system is very different than the straight-line head of the Series 7. Which head is better is likely going to be a matter of personal preference. Both products have 8-directional technology so each can easily adapt to facial contours. It is also unique with its V-Track Precision Blades Pro system that gently lifts each hair before it is cut. There are three comfort settings. Battery power is numerically represented by a digital display. A motion sensor is built in to activate the display so that it is not always on and draining power. This model includes a cleaning brush that can be clicked into the unit’s handle. At the top of Panasonic’s product line, the ES-LV95-S features a pivoting head with Multi-Flex technology. It can be used for wet or dry shaving and comes with a cleansing and charging station. The pattern of the micro-foil is quick to lift hair and provide a smooth and enjoyable shave. The Arc5 sensors detect facial hair thickness and change motor speed accordingly. An advantage of the ES-LV95-S is the five Nanotech blades in the shaving head as opposed to the three blades in Braun’s model. The easy to read LCD display is illuminated and much larger than other brands. The price was a little higher on most sites for this shaver, but it also has a more recent release date. 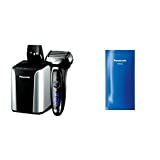 The Remington F5-5800 foil shaver is a very economically priced option. Both of its foils can flex on their own for adaptability to facial contours. Product reviews were consistently high for the majority of customers, especially in relation to the product’s price tag. There is a pop-up detail trimmer built into the device for easy trimming of mustaches and sideburns. While the surgical-grade, stainless steel blades can be rinsed under water, the razor is not meant to be used for wet shaving. It is not designed to be submerged in water, and there is no cleaning station available for this model. There is a chord for charging, and it will work whether it is plugged in or not, so a dead battery is never a problem. The options available in Braun’s Series 7 line are excellent products that we can confidently recommend. The incredibly close shave performance and the versatility to use the shaver for both wet and dry shaving make it a leader in the shaving arena. Some may argue that no electric razor can shave as close as a blade. If impossibly smooth skin is your highest priority, you may want to stick with a blade. Technologies have improved a lot, though, and most customers reported no difference in the smoothness of their face after shaving with a blade or the Series 7. The close shave may be a pleasant surprise if you have not used an electric shaver in a while. Electric shavers are very convenient, and that is one of the biggest reasons you might want to consider the Braun Series 7. The battery can be charged enough for a full shave in just five minutes, so even forgetting to put it on the charger is not a big deal. Dry cordless shaving gives you the freedom to take it out of the bathroom if necessary. While we definitely do not recommend it, at least not while driving, some men even choose to shave while in the car.